Few if any philosophical schools have championed family values as persistently as the early Confucians, and a great deal can be learned by attending to what they had to say on the subject. In the Confucian tradition, human morality and the personal realization it inspires are grounded in the cultivation of family feeling. One may even go so far as to say that, for China, family reverence was a necessary condition for developing any of the other human qualities of excellence. On the basis of the present translation of the Xiaojing (Classic of Family Reverence) and supplemental passages found in other early philosophical writings, Professors Rosemont and Ames articulate a specifically Confucian conception of "role ethics" that, in its emphasis on a relational conception of the person, is markedly different from most early and contemporary dominant Western moral theories. This Confucian role ethics takes as its inspiration the perceived necessity of family feeling as the entry point in the development of moral competence and as a guide to the religious life as well. In the lengthy introduction, two senior scholars offer their perspective on the historical, philosophical, and religious dimensions of the Xiaojing. Together with this introduction, a lexicon of key terms presents a context for the Xiaojing and provides guidelines for interpreting the text historically in China as well as suggesting its contemporary significance for all societies. The inclusion of the Chinese text adds yet another dimension to this important study. 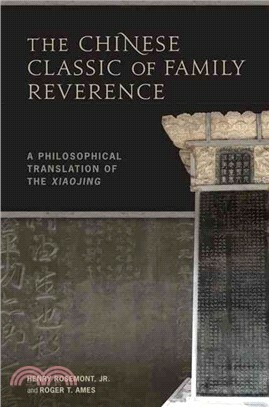 The Chinese Classic of Family Reverence is sure to appeal to specialists of comparative and Chinese philosophy and to all readers interested in the enduring importance of the family. Henry Rosemont, Jr. is currently a visiting scholar in the Religious Studies Department at Brown University. Roger T. Ames is professor of philosophy at the University of Hawai‘i and editor of Philosophy East and West.